Giovanni Bellini was one of the greatest Venetian painters of the late-fifteenth and early-sixteenth centuries, and he made a name for himself primarily through the production of religious devotional images and altarpieces. He painted a vast number of images of the Virgin and Child, of which over sixty survive to this day. Perhaps his most famous painting is the San Zaccaria Altarpiece, located above a side altar in the Church of San Zaccaria in Venice. The painting may be the most important example of a sacra conversazione scene in Italian Renaissance painting. The sacra conversazione, or “sacred conversation”, was a type of picture showing the Virgin Mary and the Christ Child among various saints from different periods of time. Sometimes these saints seem to communicate with each other, and sometimes with us, the viewers. 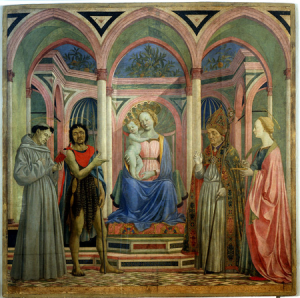 Other artists, such as Domenico Veneziano, had depicted the sacra conversazione before, but Bellini treated his painting with a particularly high level of delicacy, vibrant colors, realistic forms, and illusionistic architectural space. 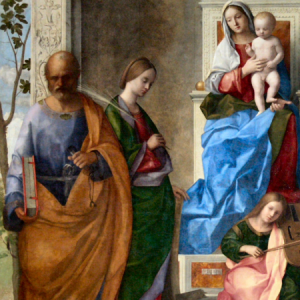 In the San Zaccaria Altarpiece, the mood is one of quiet and restrained contemplation as all the figures are demure as they stand beside the Virgin and Child as the angel performs a serenade with a violin at their feet. The scene type often shows an anachronistic gathering of figures who did not live at the same point in history. For example, in Bellini’s painting here, we see St. Peter (first century) on the left, dressed in his typical blue and orange robes, holding onto the keys with his left hand and the book in the right. Next to him is St. Catherine of Alexandria (fourth century), who is identified as a martyr by the palm branch she holds. We can tell this is St. Catherine because of the broken wooden wheel which appears by her side. According to the traditional story of Catherine, an attempt to kill her on the wheel was prevented when the wheel broke at her touch. She was later beheaded. On the right, St. Jerome (fifth century) is depicted reading a book, and next to him is St. Lucy (fourth century), known for having her eyes gouged out (presumably as a punishment for her Christianity). The composition Bellini used for the painting draws upon the Renaissance tradition of pyramidal groupings of figures. Here, the most important figures are the Virgin and Christ Child, who form the apex of the pyramid. Elevated upon a throne, they are located further back in the picture plane than are the other figures. This intelligible use of pictorial space is made possible through the keen implementation of one-point linear perspective, the configuration of which is visually understood by following the orthogonal lines of the floor tiles to their vanishing point near the foot of the Virgin. The San Zaccaria Altarpiece seen in situ. Another important aspect in the formulation of the space occupied by the figures is the architecture, which is placed in front of an open landscape that is only slightly visible to the left and right. By following the molding of the wall behind the group, we can understand it to form a rounded curve topped with a semidome or conch, similar to that of an apse of a church. 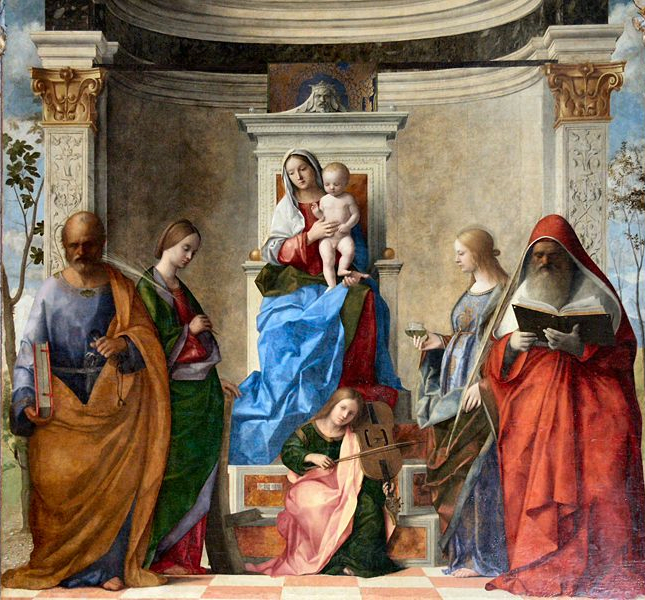 Thus, Bellini seems to have placed the Virgin and Child within sacred painted architecture in much the same way that a church altar would be placed in the actual architecture of a building (including here at the Church of San Zaccaria). Furthermore, we can see that on the left and right the arches which support the vaulting appear to project forward toward the picture plane. When viewed within the actual arch in the church which frames the painting, the painted architecture seems to be an extension of the physical space of the church. For Bellini, the painted, fictive architecture complements the high degree of realism and saturated colors to create a serene scene which is ripe for contemplation. Visitors to the church would be able to approach the side altar and experience the vivid depiction of all these holy figures through a type of “window” in the wall. ItalianRenaissance.org, "Bellini’s San Zaccaria Altarpiece," in ItalianRenaissance.org, May 3, 2013, http://www.italianrenaissance.org/bellinis-san-zaccaria-altarpiece/.